Arthur and I had a great time at the State Fair. Arthur is 9-years-old, and about 56 inches tall, so he was able to go on rides like bumper cars and the octopus ride all by himself. 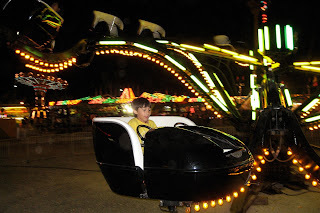 He prefers to ride with friends or family, but even without someone he knew, he was willing to ride alone on some of the rides. The sun was setting as we were choosing rides, and the air was cool, it dropped from about 24 degrees Celsius in the afternoon to perhaps 20 in the evening. When we had used up all the tickets, we went to the Ethnic Village to hear a reggae band. This was Keith Eric and the Waterhouse Band, and they were great. We tried a delicious snow cone and watched the impressive fireworks show at 10:15. This was a much better firework show than we had in Springfield for Independence Day. 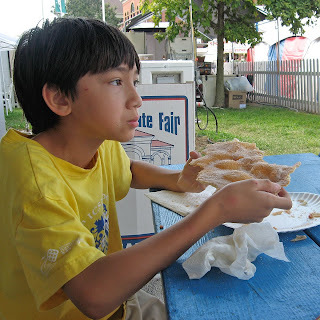 When the fireworks were over, around 10:40, we had a funnel cake from the Dutch ethnic cuisine booth. Arthur loved that. The music just kept getting better. The band played a Harry Belafonte medley, and played a couple covers of good Bob Marley songs. They had several good songs I didn't recognize, and those might be original numbers, but at any rate, they jammed and improvised and had many people dancing. 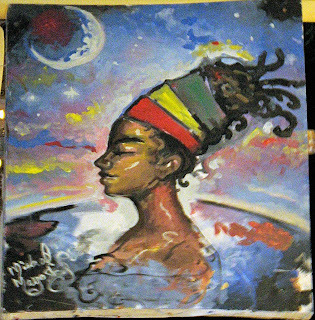 While they were performing, an artist worked on a big canvas behind them, painting a picture of a woman in a night sky background. We watched the artist start with a blank canvass, and for the first few songs, I had no idea what he was painting. Also, his canvas was on a wheel mount, so that he kept spinning the canvas around and painting on it as the canvas moved. The artist moved his brushes in time with the music as if he was another artist, so his creation of the painting really seemed like an extension of the music made by the band. Arthur was very interested in that, and I've shared a photo of the final image here. After the concert and funnel cake it was nearly 11:00 p.m., so we bought one last snow cone (Godzilla flavor, which wasn't as nice as the grape we had earlier, but was still pretty good). 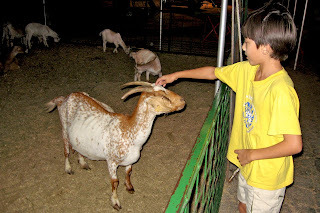 We stopped and looked at some rabbits and donkeys and goats on the way back to the main gate, where we quickly boarded a bus without any waiting, and then rode the bus back to the state capitol to get our car and drive home. It was a perfect evening. The music and fireworks were fantastic, and all the food we bought was delicious. The weather was perfect, the things we saw were interesting, and we took breaks and rested when we were tired or our legs started to get sore. I bought a great new hat, and Arthur had a wild time in the Midway riding fun rides. I'm looking forward to next year. Arthur and I went to the state fair today. This is the third year in a row I've gone to the fair, and I've had a great time with each visit. 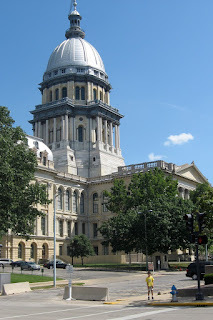 Today Arthur and I left home around 3:00 and drove to the state capitol complex, where we caught a bus to the fair. The $4 round-trip bus fare for the two of us was cheaper than parking near the fair, and I enjoy riding the bus. The person working at the state information center for visitors to the capitol complex gave us incorrect directions about where to catch the bus, but we ignored her directions and went to the place where we eventually caught the bus. As soon as we entered, we got ourselves an elephant ear and sat down in the Ethnic Village area to enjoy it. When we had finished that, we asked about where we might go to see rabbits, but the rabbit show ended on Friday (this was Saturday), so the rabbits had probably all gone home. Instead of rabbits, we watched dogs. 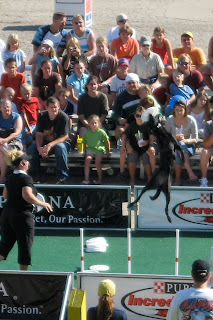 The Purina dog show was going on, so we watched dogs catch Frisbees. We had seen a show like this before, at the Indiana state fair, about five years ago, but Arthur probably didn't remember. We then went to see the exhibition of artists, which I had missed the past couple years. I enjoyed the photography and painting, and there were some interesting sculptures on display. 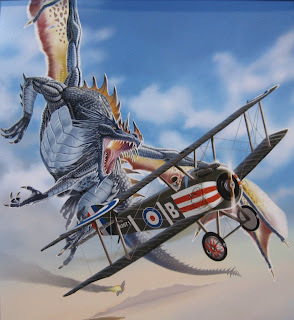 Arthur's favorite work was a computer art image of a dragon attacking an old World War I fighter airplane, I think a Sopwith Camel. We looked at some livestock and the 4-H building before making it over to the conservation area. 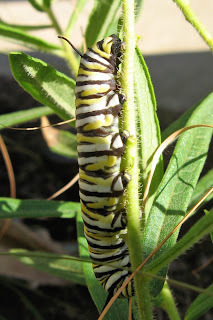 We missed the chance to ride in the big voyager canoe, but Arthur did find a nice monarch butterfly caterpillar (Danaus plexippus). 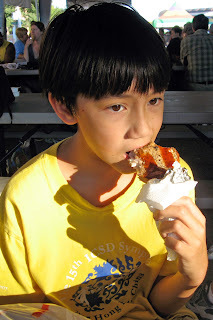 After looking at all the exhibits in the large conservation and natural resources area we stopped at the pork patio to enjoy a pork chop on a stick. This was dinner for us. I reflected that this was the first time in about three weeks I had purchased any meat, and aside from finishing hamburgers when Arthur has been too full to eat them, this was also my first meal of meat in about three weeks. But my, it was tasty. Next to the dining area was the Corona tent, and a band was playing a cover of a good Dave Matthews Band song. Looking through exhibits, I found a place selling good hats at fairly low prices, and found a good-looking black hat that fit me (I'm a 7-and-3/4, which is huge for hat sizes, and usually 7-and-5/8 are too small for me). I'd been looking for a hat that fit me well and wasn't too expensive for years (not looking very diligently, of course). I was so delighted, I bought it, and got a new belt as well. I've lost about 20 pounds since May, and I intend to lose another 20 pounds by the end of the year, so my belts are starting to be a bit big for me. 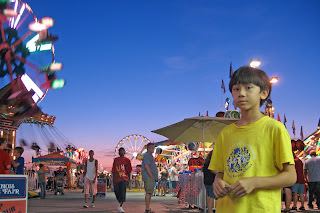 Finally, we made it to the midway, where I spent the rest of our cash (gee, $50 went pretty quick!) on 22 ride tickets for Arthur. 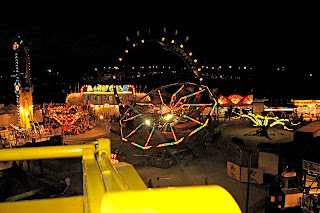 Arthur went on the hang glider ride twice, the frog hopper twice, the bumper cars once, the octopus once, and the two of us went together on a crazy type of fast Ferris wheel. I've just finished making a new web page to show off some of the artwork that Arthur has been doing. I also gathered up some images from an old page I made in 2000 to show art my sons had done and put those up on the web page. The web page gives people access to some very large pictures that include bookmarks made by some of the pre-youth Baha'i children around here last spring. You can print out these bookmarks if you have a color printer, one page on each side, and then have your sheet laminated, and then cut out the bookmarks (or cut them out first before laminating them, or use tape on both sides to self-laminate them). The bookmarks have quotations from Baha'i scriptures or reported sayings. Check them out. I was recently looking for some good books on the major political issues of the day. If someone wanted to become familiar with the big issues in economics and politics and the environment, what should they read? In particular, I wanted books that would help college students understand how institutions might be changed to solve various economic and political problems. Alperovitz, Gar (2005). America Beyond Capitalism: Reclaiming our Wealth, Our Liberty, and Our Democracy. Hoboken, NJ: J. Wiley. JK1726 .A428 2005. Bonilla-Silva, Eduard. (2003). Racism without racists: color-blind racism and the persistence of racial inequality in the United States. Lanham, MD: Rowman & Littlefield. E184.A1 B597 2003. Bornstein, David. (2007). How to change the world: Social entrepreneurs and the power of new ideas, updated edition. New York: Oxford University Press. HN18 .B6363 2007. Brown, Sherrod. (2004). Myths of free trade: why American trade policy has failed. New York: New Press. HF1455 .B733 2004. Edwards, Andres R. (2005). The Sustainability Revolution: Portrait of a Paradigm Shift. Gabriola Island, BC: New Society Publishers. (Not available at UIS Library). Greenhouse, Steven. (2008). The big squeeze: tough times for the American worker. New York: Alfred A. Knopf. HD8072.5 .G74 2008. Hamilton, Lee H. (2004). How congress works and why you should care. Bloomington, IN: Indiana University Press. (not available at UIS Library). Hawken, Paul. (2007). Blessed Unrest: How the Largest Social Movement in History Is Restoring Grace, Justice, and Beauty to the World. New York: Viking. GE195 .H388 2007. Lichtman, Allan J. (2008). White Protestant Nation; The rise of the American conservative movement. New York: Atlantic Monthly Press. JC573.2.U6 L53 2008. McKibben, Bill (2004). Deep Economy: The Wealth of Communities and the Durable Future. New York: Holt. (Not available at UIS Library). (paperbook version was published in 2008). O’Rourke, P. J. (2007). On “The Wealth of Nations”. New York: Atlantic Monthly Press. Obama, Barack (2004). Dreams from my father: a story of race and inheritance. New York: Times Books. E185.97.O23 A31995. Orfield, Myron. (2002). American Metropolitics: New Suburban Reality. Washington, DC: Brookings Institution Press. HT334.U5 O72 2002. Redman, Eric (1973). The dance of legislation. New York: Simon and Schuster. KF4980 .R4. Sen, Amartya (1999). Development as Freedom. New York: Knopf. HD75 .S455 1999. Stern, Andy (2006). A country that works: getting America back on track. New York: Free Press. HD8066 .S74 2006. Stiglitz, Joseph E. (2006). Making globalization work. New York: W.W. Norton & Co. HF1359 .S753 2006. Vollmann, William T. (2007). Poor People. New York: Ecco. HV4028 .V65 2007. I was concerned that this list of books didn't seem to have enough views from conservative or libertarian viewpoints. I'm pretty liberal or radical in most political questions (although I hold a few reactionary or conservative views here and there on particular issues). So, I started looking for conservative reading lists. I figured that the various well-funded conservative think-tanks such as the Heritage Foundation, the American Enterprise Institute, and the Cato Institute would have some good books, and so I started with their websites. The Cato Institute has never impressed me with the scholarship of the work they present. In fact, it's usually easy to find serious problems in any report issued by the Cato institute, but sometimes they make some valid points or present some interesting data, and their stuff is always thought-provoking, even if it's substantially weak. As I look at the books they have recently published, I notice several that I might consider adding to my list. One thing I notice, however, is that every book from the institute seems to carry a certain Libertarian position against big government. If you compare the list to the books and reports published by a more liberal or moderate think-tank such as the Brookings Institute, the Rand Corporation, or the Center on Budget and Policy Priorities, you can (I think) sense a real difference in the focus and quality of publications. The more non-partisan or liberal think tanks produce work that address a wider variety of issues and problems, and the policy recommendations generally seem (to me at least) to come from reasoned evaluation, rather than a consistent ideological position. The Heritage Foundation has a few books that aren't grinding that same ax against the government and taxes. The American Enterprise Institute actually seems to have a broader set of publications that apparently take a more scholarly and analytical position. What about book clubs and what they are suggesting people read? The Conservative Book Club doesn't seem to feature any of the better books from scholars at the conservative think-tanks. Instead, it has books by the likes of Ann Coulter and Jonah Goldberg. You can get books from them such as "The Case Against Barack Obama" or "Conservative Comebacks to Liberal Lies" or "The Politically Incorrect Guide to Islam (and the Crusades)." These books seem to me to be motivational books written by in-group leaders for their faithful to read as part of a faith-and-intuition-based identity movement around "conservatism," but I don't think these books really provide much intellectual or analytical foundation for sound conservative political philosophy. At least, I don't see how a book like "If Democrats Had Any Brains, They'd Be Republicans" is going to encourage critical thinking and reasoned debate based upon empirical evidence and logical propositions. The Conservative Book Service seems slightly more sophisticated. They offer us "Black Belt Patriotism" by Chuck Norris. Oh yes, they carry Ann Coulter books, and have a whole section of books on the Clintons. I compare this to the books offered by the Progressive Book Club. They also carry some books by authors on the silly fringes of the left (I doubt I could stomach Jim Hightower's "Swim Against the Current" even if I agreed with most of what he says in it). Yet, most of the books seem to be more thoughtful and scholarly. I would really like to read Richard Hofstadter's "The Paranoid Style in American Politics," and I've already read and can recommend Michael Pollan's "The Omnivore's Dilemma." Why aren't there more conservative counterparts to the sorts of books carried by the Progressive Book Club or the reports issued by the liberal and moderate think tanks? Why are the conservative book clubs and think tanks so frustratingly dependent upon shallow books by people who can write opinion, but have poor skills in presenting good information? I wish the conservatives had more intellectual voices and more convincing books. Can anyone recommend some really good conservative books on current issues that I could add to my list? Aside from P.J. O'Rourke, who is a sort of intellectual conservative humorist (and a great writer), but not really a scholar by any means, I don't really have any solid conservative authors in my list.